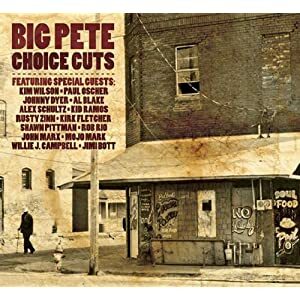 Don’t have a copy of Big Pete’s Choice Cuts as yet? Then do this: go to the loneliest railroad crossing you can find on a dark, dark night. Stand as close to the tracks as you dare (safely, please) until a roaring freight train overwhelms your senses with sheer, unstoppable, ground-shaking power. That’ll give you a feel for what Big Pete’s amplified harmonica sounds like - dirty and dangerous, gloriously greasy and magnificently muscular. Pieter “Big Pete” Van Der Pluum’ isn’t the typical blues background; he’s Dutch (as one might guess, with a name like that), and lucked into this recording when Delta Groove label honcho - and a pretty mean harmonica player himself - Randy Chortkoff caught a live show. Chortkoff signed him on the spot, and arranged to have a good chunk of Delta Groove’s unrivaled roster on hand for the resulting sessions. The core band includes ace guitarist Alex Schultz (ex-Rod Piazza’s Mighty Flyers) and one of the best rhythm sections around in bassist Willie J. Campbell and drummer Jimi Bott (also a former Flyer). Guests include fellow harmonica masters Kim Wilson and Al Blake, guitarists Kirk Fletcher, John Marx, Kid Ramos, and Rusty Zinn, with Rob Rio adding piano and Johnny Dyer handling vocals on a track. It’s a powerhouse lineup, and the bed tracks they lay down in support are, as expected, absolutely top-notch, whether the groove is hard-core Chicago grinder or west-coast swing. There’s much more of the former here – most of the material comes from the likes of long-time Muddy Waters sidekick Jimmie Rogers (“Act Like You Love Me,” “Left Me With A Broken Heart”), Little Walter (“Just Your Fool”), Willie Dixon (“I’m A Business Man”), and Howlin’ Wolf (“Rockin’ Daddy”). Big Pete reportedly discovered the blues through the late Lester Butler, so it’s fitting that he kicks things off with Butler’s “Driftin,” while “Chromatic Crumbs” comes from the late William Clarke, another major influence. The instrumentalists get all the attention, but blues ultimately depends on convincing vocals, and Pete is up to the task. His delivery might depend more on enthusiasm than subtlety, but given the raucous grooves and boisterous sound, he’s just right, powerful and assertive. His harmonica work follows a similar esthetic; big and bold, raunchy and dirty and more concerned with raggedly righteous sound than refinement or delicate displays of dexterity; this is, after all, over-amplified music that emerged as a response to the daily din of post-war urban life. It’s a classic sound, to be sure, but while the forms may be standard – even the lesser-known tunes ride familiar grooves – individual contributions are exemplary, and despite years of experience, everyone involved plays with unbridled energy and enthusiasm to match Pete’s infectious exuberance. If you’re a fan of harmonica-driven electric blues, this one’s essential!